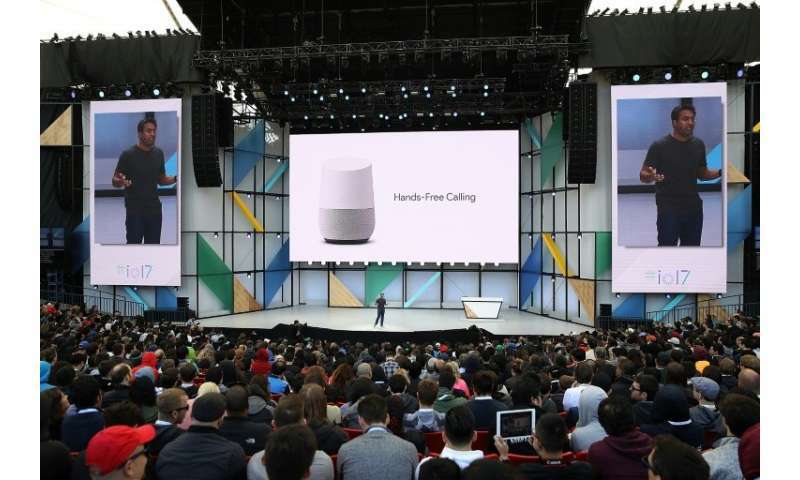 Google said Thursday it was launching a radio-style, on-demand audio news feed available on smart speakers, personalized with the help of artificial intelligence. The technology giant said it had partnerships with more than a dozen news organizations to deliver an audio feed in the same manner as its smartphone news feed. "This new experience will bring you an audio news playlist assembled in that moment, for you," Google product manager Liz Gannes said in a blog post. "It starts with a briefing of top stories and updates on topics you care about, and extends into longer-form content that dives deeper into more stories." Google Assistant, the AI program developed by the company, will manage the feed, allowing users to skip a story, go back or stop. The project aims to transform audio news into a Netflix-like experience, available on demand with personalized recommendations. "For the past century, radio has been a one-size-fits-all medium," Gannes wrote. "Turn on the radio and you're dropped into a show at a moment in time—regardless of what you already know, where you are, or what you're interested in. "Imagine instead if you could have your own radio, one that's available on-demand, accessible throughout your day, and brings you news about the world and your interests." The new project builds on Google's existing efforts to deliver news over its speakers and smartphones, and comes amid a broad effort by news organizations and tech firms to develop more voice services. The audio news feature will roll out first to a limited number of people using the Google Assistant in the United States in English, the company said.